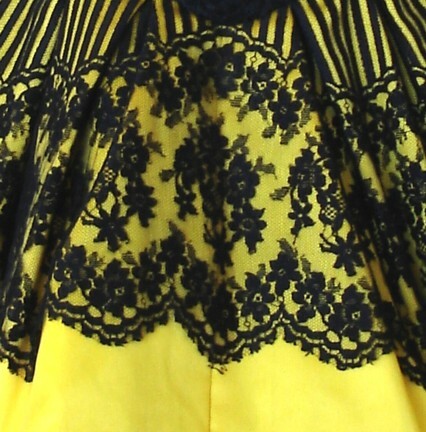 Rare Christian Lacroix strapless corset pouf dress circa late 1980's. From his first line, started under his own brand, these dresses - with their flamboyant fabric and adornments - made a big splash in the fashion world during this period. Not many were produced at the time so this is a rare piece, and in excellent condition. 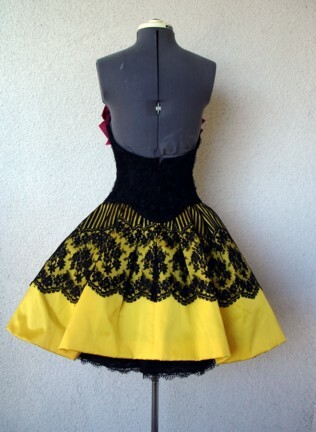 Strapless boned corset of black lace with short heavy yellow/gold satin with black lace overlay. Decorative rose pink grosgrain ribbon bow placed at bustline. Double black tulle crinoline with lacy peek-a-boo hemline beneath to give a bouyant pouf effect. 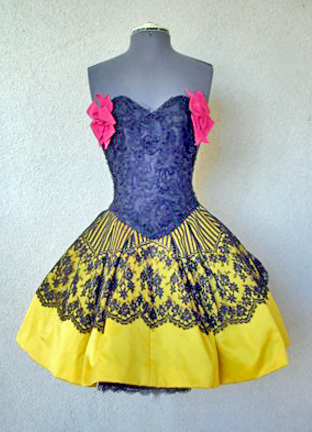 Size: 36; bust: 30"; waist: 24"; length: 29.5"